Team GB's five-year battle with Russian doping cheats has ended after being officially upgraded to bobsleigh bronze, the British Olympic Association (BOA) has confirmed. The International Olympic Committee (IOC) banned three Russian bobsledders following the 2016 McLaren report. John Jackson, Bruce Tasker, Joel Fearon and Stuart Benson finished fifth in Sochi behind two Russian crews. "Finally we have the result we have waited so long for," Jackson said. "Disappointingly, it is a medal we should have received on an Olympic podium in 2014. "Cheats have cost us that moment, along with other nations too. Recognition from the IOC of the Sochi 2014 Winter Olympic four-man bobsleigh result is a big step forward to us receiving our Olympic bronze medal." 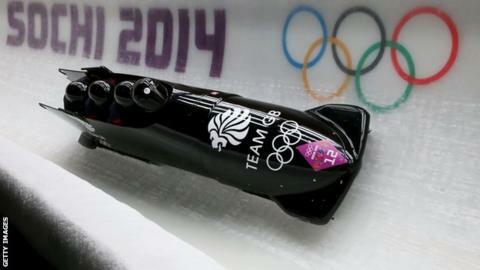 Jackson piloted the four-man bobsleigh team made up of Welshman Tasker, England's Fearon and Benson of Scotland. "Everyone involved in British Olympic Sport, and most particularly the athletes, will be delighted by the overdue award of the four-man bob bronze medal from Sochi," Chairman of the BOA Sir Hugh Robertson said. "However, it is yet another example of British athletes denied their moment of podium glory by state sponsored cheating." Athletes from both Russia 1 (gold medallists) and Russia 2 (fourth) were found to have committed doping violations following thorough re-analysis of samples taken at the Games. The IOC subsequently banned bobsledders Alexander Kasyanov, Aleksei Pushkarev and IIvir Khuzin. The bronze brings Team GB's medal tally from Sochi 2014 to five after Lizzy Yarnold's skeleton gold, Jenny Jones winning snowboard slopestyle bronze, and silver and bronze medals for the men's and women's curling rinks respectively. GB bobsleigh performance director Gary Anderson, who left the setup in August 2017, told BBC Sport: "I'm delighted for the athletes, because I know what they went through to achieve this result. "In 2010 we set the target to medal in Sochi, we meticulously planned for it, we can now say we achieved that. I just want the athletes now to be acknowledged." The GB four-man squad have long known they were likely to be upgraded but they have endured an agonising three years of waiting since retesting of samples from the 2014 Olympics began. During that time there have also been numerous appeals by the Russian athletes and their federation as they tried desperately to reverse the decision to strip them of this and other medals from their home Games. This confirmation is a much-needed boost for British bobsledders who last claimed an Olympic medal through a third-place finish at the 1998 Nagano Games. The GB four-man team finished a disappointing 17th and 18th at the 2018 Winter Games and last year UK Sport decided to withdraw all of their funding for the next Olympics - Beijing 2022. The Russian team who won on the day in Sochi are refusing to return the gold medals they were awarded at the time meaning new medals will be issued to the 'new' winners Latvia. The athletes will be allowed to decide where they would like to be awarded the medals, with a presentation at the next Winter Olympics in 2022 a possibility. However, with around three years to go until those Games it's possible that a presentation could be made elsewhere at an earlier date.